Welcome to Aura Photography and Chakra Imaging! Imagine being able to watch your Aura and Chakras transform before your eyes! 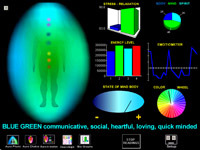 The Aura Photography and Chakra Imaging System is a Multimedia Biofeedback system that uses the Science of Biofeedback, Color Therapy and Energy Medicine to measure, analyze and display an interpretive representation or your emotional-energetic State, your Aura. We are very privileged to offer the services of the Aura Photography and Chakra Imaging System. This tool provides valuable insight and guidance for self-empowerment. With many other aura photography systems, the aura photo shows the aura around the head. With the Aura Photography and Chakra Imaging System, you receive an Aura photo and an image of your Chakras! We love the Aura Photography and Chakra Imaging System as, besides taking an Aura photo and a Chakra image, it provides a real-time, continuous “read-out” of your Aura and Chakras. With the Aura Photography and Chakra Imaging System’s interactive capabilities, you watch your energy field in real time. For the first time, you can see the dynamic interchange of your Chakras as you experience different thoughts, emotions, and therapeutic modalities. Imagine seeing your energy field, in real time, right before you eyes! Watch your aura change as your chakra energy changes!